Robert Utter: I’ve previously introduced myself but I forgot to ask you to give your name and your title and the country that you come from. Okay. My name is Dennis Byron. I’m the President of the ICTR and I come from the country of St. Kitts-Nevis, in the, in the Caribbean. RU: And how long have you been with the ICTR? I joined the court in June, 2004. RU: And have you always served in your current position then, since joining the court? Oh no. The, the Presidency of the tribunal is elected, elected by the judges at Plenary Session. So I came in as a, as a judge and it was in May of 2007 that I was elected as President. RU: And you have arrived at a time of many challenges? RU: Tell me where you were in 1994? RU: Yes. When the genocide started. Well, I was, I was a member of the court of appeal of the Eastern Caribbean Supreme Court, based in St. Lucia. RU: And how did you become aware of the genocide? Well, well, I, my, my awareness level at that time was, was low. I just was a, a, a spectator from my home country. And the news, as it was reported, on world, world news stations. At that time I had no idea that I would be connected in this way with that tragedy. RU: And how did your appointment to the tribunal occur? Again, that was something quite coincidental. 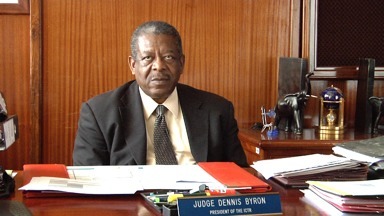 Judge Lloyd Williams, who was a national of St. Kitts-Nevis, had been elected to the tribunal in the normal appointment process and he resigned. And under the rules that govern these, the appointment process, St. Kitts-Nevis, had the right of a nomination, of nominating his succ-, his successor and I was nominated and accepted by the UN, both the General Assembly and Security Council and appointed. RU: Given your, given your background, it’s easy to understand why you were nominated. It’s an impressive one, sir. But did the nomination surprise you or was that . . . Yes. I was not consulted before I was nominated and I had not asked for it. RU: So it was a true surprise? RU: Let me switch a bit then, if I may, and talk about what we hope to accomplish with this information project. It’s essentially trying to establish for times in the future, far beyond what we can speculate on at this time, a way where people can understand the humanity of the people who were on this tribunal. RU: They can find in books and records, the records that have to be found, but we want to give the public 50 to 100 years from now some idea of the people involved. And I wonder in this frame of mind, if you have something that you would like to say that may be looked at 50 or 100 years from now, first about the nature of the tribunal and then words of advice to the judges who may sit in some future tribunal? Well, the nature of the tribunal. Well, I, I must say that I have, even before coming here and getting caught up in the, in the administration of, (____) international criminal, criminal justice, I did have a philosophical support for the idea of an international, legal or judicial order. So the, the idea that there would be some form of criminal justice system, which formed a routine of international life had appealed to me for some time. Now, this court is an ad hoc court . . .
. . . it’s, it’s, was created for a specific situation and with a, a time, time frame. So it does, what I think that the work that the tribunal has done has laid a, a foundation for the development of a long-standing international criminal justice system, which I find an attractive, an attractive idea. I, I think I mentioned to you that I had a particular feeling of, of, I suppose, satisfaction when I, I digested the thought that the, the, a political body like the UN would, would consider that to achieve political objectives, such as peace, restoration and reconciliation, and abolishing impunities, that the concept of a system of, of impartial justice was a, a method that could be adopted for it. So I, I, I think that, that, that in order to, to honor the trust placed in the tribunal, the judges have to guarantee the fairness of the trial process and I think that, that however else the tribunal has to be judged or may be judged, at the end of the day, I think that our acceptance will depend on whether the reasonably informed onlookers would believe that both the process and the result was fair. And I think that probably is the most important mandate and obligation of judges in these tribunals and tribunals of this nature; the upholding of the concepts of fair, fair trials. RU: The reality of fairness and the . . .
RU: . . . appearance of fairness.